The Phoenix Stadium was designed by New York architect Peter Eisenman in partnership with HOK Sports and Hunt Construction Group. The University of Phoenix Stadium is a prime example of sophisticated engineering, technology, and design. It is home of the Arizona Cardinals Football Club (NFL). Surrounding the stadium, are Glendale homes, ranging in price from $200,000 to $2.5 million. In March 1994, the Cardinals were christened with a new name, the Arizona Cardinals. Although they received a new name, there is nothing new about the oldest team in terms of continuous operation in pro football history. A charter member of the National Football League, the Cardinals trace their history back to 1898. This is when Chris O’Brien formed the Morgan Athletic Club. A few years later, he bought used jerseys from the University of Chicago. He described the faded maroon clothing as “Cardinal red”. The team, then playing at 61st and Racine Street, became the Racine Street Cardinals. The American Professional Football Association, the direct forerunner of the NFL, began to play in 1920. The Cardinals faced an immediate challenge for territorial rights in Chicago from a team named the Tigers. The Tigers joined the league after the organizational meeting on September 17. O’Brien and the Cardinals promptly challenged the Tigers to a game. The losers had to leave town. The Cardinals won the game. They also won the franchise rights, the legendary Paddy Driscoll scored the only touchdown in a 6-0 victory. 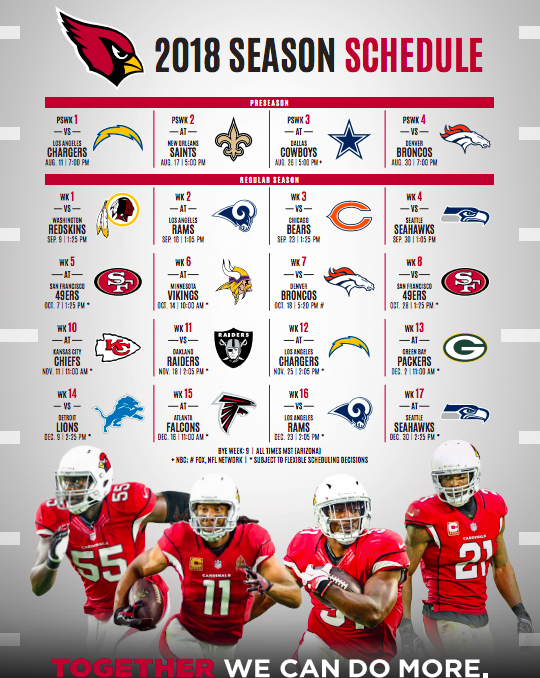 The Cardinals experienced only minimal success on the playing field during their first 26 seasons in the league. The exception was in 1925 when they edged out the Pottsville Maroons for their first NFL championship. A Thanksgiving Day game in 1929 did produce an all-time highlight when the Cardinals’ superstar running back, Ernie Nevers, scored all 40 points. This is an NFL record that stands today, a 40-6 victory over the Chicago Bears. The Cardinals began a continuous period of family ownership in 1932 when Charles W. Bidwill bought the team. His son, William V. Bidwill, now operates the team. Bidwill kept the Cardinals operating during the depression days of the 1930s and the World War II years of the early 1940s. He finally put together a winning unit just as the war ended. Bidwill’s building program produced a team that won an NFL championship in 194. They also won the NFL Western division title in 1948. The Cardinals’ 28-21 victory over the Philadelphia Eagles for the 1947 championship stood as one of the team’s last playoff victory. The exception was a 20-7 win over the Dallas Cowboys in the 1998 NFC Wildcard Game. The team’s coach, Jimmy Conzelman, is now a member of the Hall of Fame. Additionally, Charley Trippi, a key member of the famed “Dream Backfield” that Bidwill fashioned is also a member. The unit also included Paul Christman, Pat Harder, Marshall Goldberg and Elmer Angsman when Goldberg moved to defense. In a cruel twist of fate, Bidwill died before seeing that team in action. Since joining the NFL, the Cardinals have called three cities home. After 40 seasons in Chicago, they moved to St. Louis in 1960. The Cardinals seriously challenged the Cleveland Browns twice for divisional honors in the 1960s, but they fell a one-half game short both in 1964 and 1968. For a time in the mid-1970s, the St. Louis Cardinals were serious championship challengers. They won NFC Eastern division championships in both 1974 and 1975 but lost in the first round of the playoffs each year. The franchise was moved for a second time in 1988 when William Bidwill selected Phoenix as the new home city, where they played at Sun Devil Stadium. The Cardinals, who opened the state-of-the-art University of Phoenix Stadium in 2006, found instant success in their new home, winning multiple division titles and an appearance in Super Bowl XLIII.